There are very few things that a cake won't cure. From gray days and heavy rain to sickness and nostalgia. This winter has been brutal for a lot of folks. Here we have been spared from the general malaise of being stuck in a never ending cycle of snow days, blizzards and freezing temperatures. We did have a very minor taste of it last week with a little very slushy watery snow blanketing our street one evening. First time Tiggy the new pup experienced the snow. She had a blast, slid down a small hill a couple of time and like me, enjoyed the quietness that comes right after it falls. In anticipation of a snow day and potential loss of electricity (didn't happen), I went ahead and cooked a bunch of the vegetables and proteins I had in the fridge and freezers as well as the fruits laying about on the countertop. 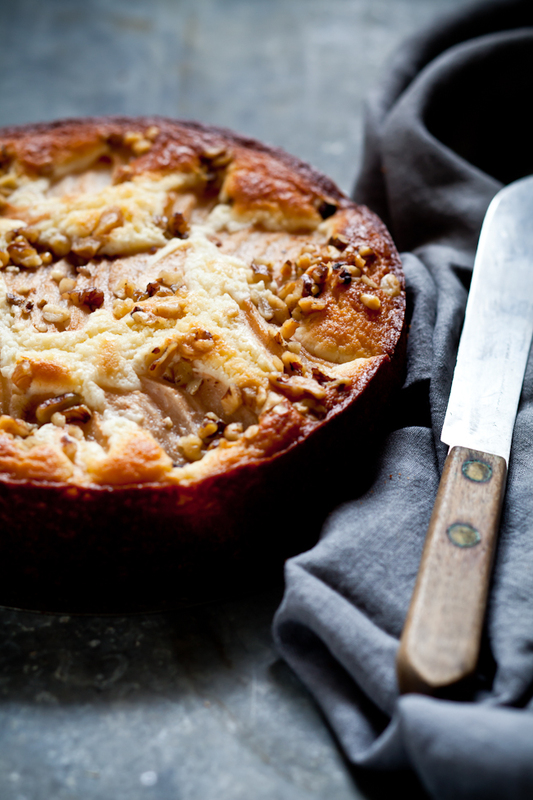 The results were a couple of stews and soups, a batch of pear financiers and this yogurt based pear cake. This cake is my go-to, fullproof, can't-mess-it-up-even-if-you-tried cake. We learn to make this cake almost as soon as we can stand and stir in my family. All my aunts have equipped with and taught this recipes to their sons, my grandmother passed it on to my mom who passed it on to me and my brothers. It's a never ending cycle of goodness as we pass it on to the next generation of kids, siblings or friends. And now I am passing on to you. It can be as understated as plain with a good cup of tea or studding with fruits, chocolate, nuts, flavored with vanilla, walnuts, lemon and anything in between. 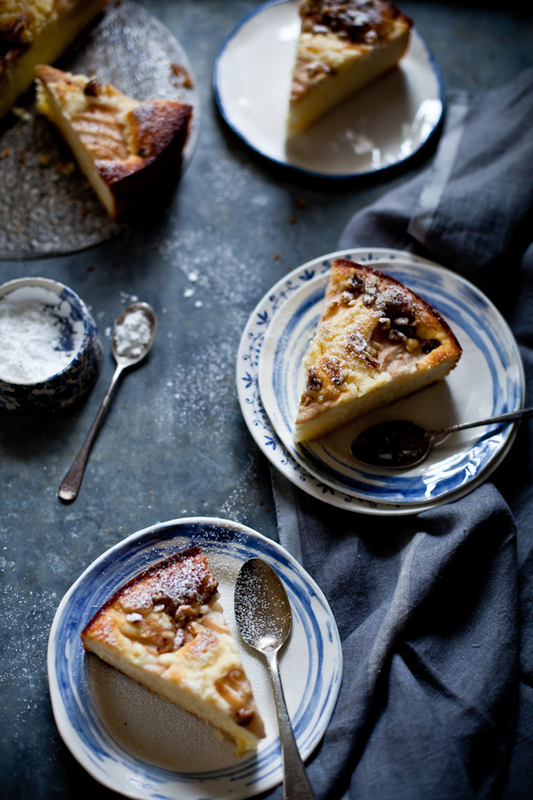 The result is a tender and crumbly cake that never ceases to comfort and make people smile. Preheat the oven to 350F and grease and flour a 9-inch baking pan. Pour the mixture in the prepared baking pan. Place the pear slices on top and sprinkle with the walnuts. Bake for about 40-45 minutes or until a toothpick inserted in the middle comes out free of crumbs. Let cool completely before slicing. It looks fabulous, you got me at foolproof! Wow I love the olive oil and yogurt that is added to this cake! And I am in complete agreement- there are few things that cake can't fix...pinning it for later! Such stunning images as always! What a handsome cake. mmm, that looks so good! I'm wondering if this will work in a cast iron skillet? must try...looks wonderful! Love this post! So excited to say I bought your book and decided to promote it on my blog because I love it! This cake does really look good. Wife always says though that she can mess up any cake ~ but I'm still going to share this link with her because it sure looks like her type of cake. She loves walnuts and says they help cut down on belly fat. Can't confirm that! She says the last cake she made was really bad and wants a private tutor, but I thought it was fine. Let them eat cake, right?!? What a beautiful post and recipe! I love that this combines yogurt and olive oil for extra "healthy" moisture, I look so forward to giving it a try... How special to think it's been passed from generation to generation and now on to your many followers, thank you for sharing! What a gorgeous cake. I can see why it's a family tradition. And now I have an excuse to invite friends over on Sunday afternoon. Can't wait to try it! Oh my goodness this sounds like a slice of heaven. We are getting slammed with snow this winter and I'm at my wit's end. This cake will make things better tomorrow when we are supposed to get more bloody snow. Thank you! This cake looks perfect nothing beats a family recipe I seriously need some cake now. Your cake looks fantastic. I will try it during the weekend only in the gluten free version. I made this cake using sour cream instead of the yogurt, because we had it on hand, and cinnamon sugar instead of the walnuts because we have allergies. hello, looks good. do you sift the flour before? how much is it in grams? very nice blog. What an attractive cake! I think I may try it with apple slices. love this post! Looking forward to trying this cake. It sounds yummy! Made a few of your recipes in the past, they all turned out real good. Can you please confirm the amount of oil? I made this cake today and it turned out pretty gummy even after baking it for an extra 25 min. What a stunner! I love using yoghurt in recipes, gives such a gorgeous creamy texture. Yum. Shaz: yes, it's 3/4 cup. My family actually uses a full cup but I find that 3/4 works just the same. The gummy texture may not come from the recipe or its execution but maybe a problem with the oven running lower than what you actually set it for. Adding about 10-15 minutes of cooking time might do the trick or having it calibrated also would work. I love the idea of a family recipe and jumped right into making this recipe! However, I was totally disappointed with my dense cake and had to throw it out. I used cake flour instead of regular flour and sifted it. Was this the problem? I don't think it could've helped even if I cooked it more than 40 minutes. Any suggestions? 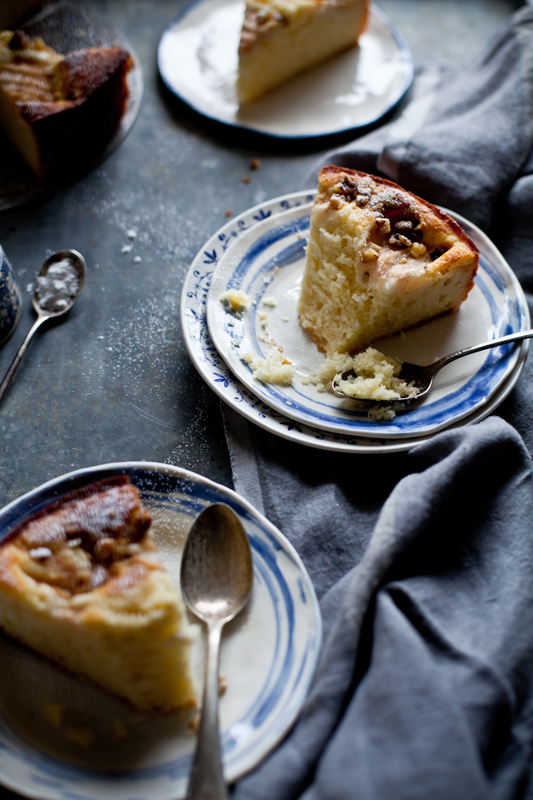 Cynthia: I make this cake about once a week and have never have it turned dense. A few things could contribute to changing its consistency: extra large eggs versus large eggs, beating the flour too long which develops too much gluten, oven running higher than the displayed temperature. 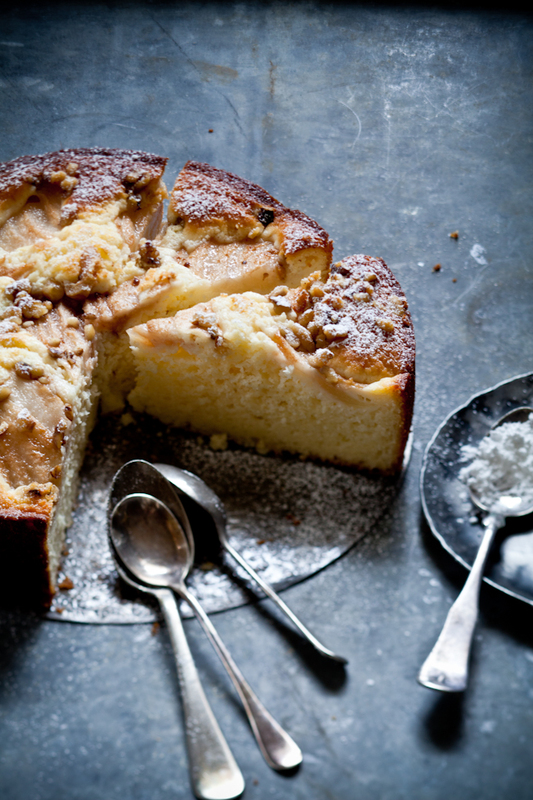 I have a fridge full of pears and can't wait to make this cake! But I've got one, possibly silly, question: is it plain olive oil you use or extra virgin?